Cyclists and pedestrians have access to a new crossing path on Newhall Ranch Road. 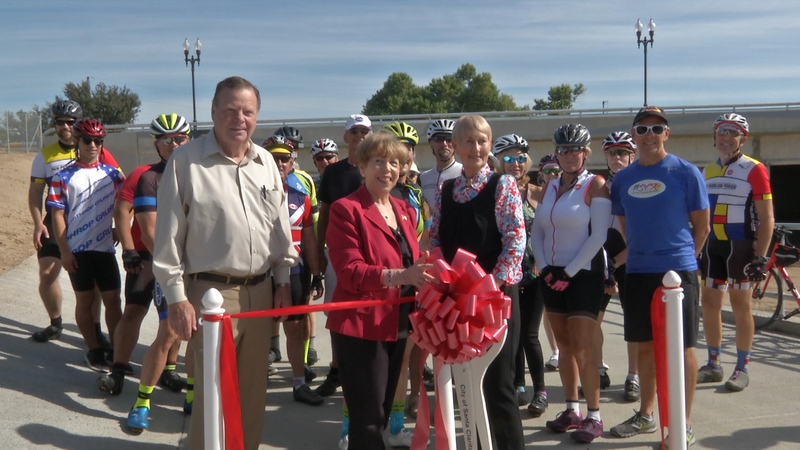 A ribbon cutting was held to celebrate an addition to the San Francisquito Creek Trail under the Newhall Ranch Road Bridge. The addition is a 16 foot wide trail undercrossing on the west side of the Newhall Ranch Road Bridge. The addition provides an alternate path for cyclists and pedestrians to cross Newhall Ranch Road. The project is part of the Newhall Ranch Road Bridge Widening over San Francisquito Creek, which is updating the bridge by adding two more travel lanes, a raised median, barrier protected sidewalks and a bike trail.